Freelancers are constantly on the look-out for new clients. But one thing we often overlook are opportunities in telecommuting. Telecommuting, strictly speaking, is not the same as freelancing. Telecommuters are employees but are able to perform their work at home, or anywhere else. Sometimes, telecommuters need to report to the office for meetings. Other times, not at all. More and more companies are using telecommuting arrangements to save money otherwise spent on office maintenance, employ talent from out of town, and enjoy the other advantages that telecommuting offers. Recently, I accepted a telecommuting position. At first, I was hesitant because I consider myself a freelancer 100%. But after much thought and prayer, I realized the opportunity met all the items on my “Yes” list. For freelancers, this can be a good thing, and it can also be a bad thing. If the telecommuting job means you’re not able to accept freelancing clients anymore, then you are, in effect, limiting your income. On the other hand, other freelancers may be willing to make that sacrifice in exchange for a predictable and stable income. Also consider that you will no longer have to spend as much time, money, and energy marketing yourself to make the same income. As a telecommuter, you’ll be required to have a basic office setup, such as a computer and Internet connection. However, employers are willing to cover additional logistical requirements you need, such as certain software. In some areas, employers of telecommuters are even required to insure their employee’s home offices (check your local laws). Freelancing is lonely. When you telecommute, you become part of a team, even if you’re all working from your homes. For me, just knowing the whole success or failure of a project doesn’t fall solely on my shoulders is a good feeling. My telecommuting job found me. The company owner discovered me through a Google search (so optimize your websites, people!). However, when I became aware of this opportunity, I dug deeper and found so many other opportunities. Flexjobs.com is an online repository of telecommuting and part-time jobs. You need to pay a monthly fee to access the details of job openings. I also found some telecommuting jobs in AWAI’s job board, which also includes vacancies from Flexjobs.com. Most of the opportunities I’ve seen are for programmers, writers, and sales professionals, but the skills required are wide. What do you think? Would you be happy as a telecommuter? What excites you about it? What don’t you like about the thought? Let me know what’s on your mind. Post a comment below. Affiliate Disclosure: I am an affiliate of AWAI and will earn a commission if you purchase their programs through my link. I credit AWAI for helping me become a better and more successful copywriter, so obviously, I highly recommend their programs. However, nothing is right for everybody, so please do your due diligence before purchasing from them or any other vendor. I start a part-time telecommute job next week. I also have private clients on top of that, and together, it’s a decent workload and pay. I write for the healthcare industry and there a lot of jobs out there. The problem is that typically they are in office positions. I have tried negotiating with workplaces for some telecommute and it was a total failure. A lot of companies have no concept that writers don’t need to be in cages and watched while we write. One word of advice: Don’t tie yourself to a low paying PT job. It will hurt you in the long run. Set a minimum rate and don’t accept anything less than that. Trust me on this. I’ve learned the hard way. 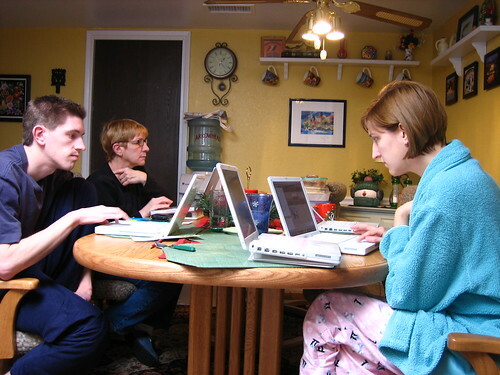 @Caroline Leopold – PT telecommuting and freelancing are a good combination. Thanks for sharing your lessons from experience! May I ask what type of assignment you start next week? I’m looking to phase out of a fulltime job and am interested in your opinion. Hey, congratulations on the telecommuting position! I think telecommuting is a great compromise — the security of being an employee with the advantages of working at home. I know that for some, giving up the autonomy of being 100% freelance is difficult, but when the economy is still shaky, some type of security against the famine cycle of freelancing is a good thing. It is good to telecommute unless you have boundaries which you have conveyed to your family or have a separate place for your office otherwise it is hell. @Guarav Chandra – Good point! I need to constantly remind my children, when they’re home, that they can’t just walk up to me and interrupt me while I’m working. I am looking to move more into this type of arrangement, Telecommuting + freelance clients. My skill set is in business development,marketing&sales. However, most of the jobs I’ve seen for sales/biz development/marketing usually are offered on a commission basis and I’m looking for a more stable PT income to offset income between freelancing clients. Do you have any suggestions on this, also may I ask what kind of assignment/work you found that fits into your freelancing life? @Tim – I’m a web copywriter and that’s the type of telecommuting job I found. I hear you on the commission-basis thing. My hubby’s in marketing and those are most of the jobs available to him as well. My suggestion is to keep looking. Pick half a dozen companies you’d like to work for and see how they do things. When I looked into telecommuting, I was surprised to find so many companies who are already doing it. But then, I’m a writer, which seems to fit well in a telecommuting arrangement. i personally feel it may not effect on income..but very interesting and informative article.